As of April 28th, I am now employed by Scan Digital. I’ll give you three guesses what I do as a scanner technician at Scan Digital. I work the night shift, which is 3:30 to midnight, Monday through Friday. You know what that means? No weeknight Dodger games. But it frees me up to go during a weekday afternoon and Saturday games. And it means I can save up for good tickets and a new camera! So, while my friends and I are sad that I will no longer be able to go to weeknight Dodger games (unless it falls on a holiday like Memorial Day)… the bright side is after a year and a half since I lost my job at Talbots, I now have steady work! During that time period, I worked on short term projects, internships, baby sitting, and my “other” job. I will still be working my “other” job. There’s no way I’m giving that one up. I thought about it. And I figured it was worth the sacrifice. Besides, I have a radio. I can still listen to the games. I’m very excited about my new job. I love it. What’s the saying about work isn’t work when you’re doing something you love? Since I am currently out of favorite players (and my friends told me not to pick any new favorites since they seem to leave the team within a day) … I decided to see how my minor leaguers are doing. I’ll start from the bottom and move closer to my favorite guys. John Lindsey and Justin Sellers aren’t doing well. They’re both hitting below the Mendoza line. Travis Schlichting isn’t pitching well either. He’s given up 9 earned runs in about 12.1 innings pitched. John Ely isn’t faring too well either. He’s got a 1-1 record and 2 no-decisions. Jamie Hoffman is batting .348, which is 24 hits in 69 at bats. He’s got 11 extra base hits, four of them are home runs. Dee Gordon is the short stop of our future. I can’t wait to see him get called up and get his chance to play in the big leagues. I got to see him play during the exhibition games and this guy can score from first on a single! He is fast. Then again, this is Flash Jr. And he’s got the best manners of any player you will ever meet. He’s hitting .303 with 30 hits in 99 at bats (4 extra base hits, one of the a triple) and has scored 20 runs! That’s two-third of his hits, not to mention he’s got 7 walks. Though he has 20 strike outs to his 7 walks. He’s a little guy, so I’m not too surprised that he has no homeruns. Unfortunately, even though he has 20 hits, he only has 9 RBIs. He’s got 12 out of 14 stolen bases, like I said, the kid can run. Trent Oeltjen is another fast guy. I didn’t think he was that fast. Of his 25 hits in 77 at bats (giving him a .325 average), 11 of them are extra base hits. Of his extra base hits, he has 3 triples and 5 home runs. He’s got 5 stolen bases in 7 attempts. He has 27 strike outs and 10 walks. A.J. Ellis who has only been in the minors for 5 games. So he’s stats haven’t really had a chance to average out yet. He has a 4 game hitting streak. He’s hitting .412 in 17 at bats with 7 hits. Of his 7 hits, 3 of them are extra base hits. He has 5 RBIs, 2 runs scored with 2 walks and 1 strikeout. Again, he’s only had 17 at bats in 5 games so his average hasn’t exactly evened out yet. Even his OBP, SLG, and OPS are astronomical (.474, .588, 1.062 respectively). 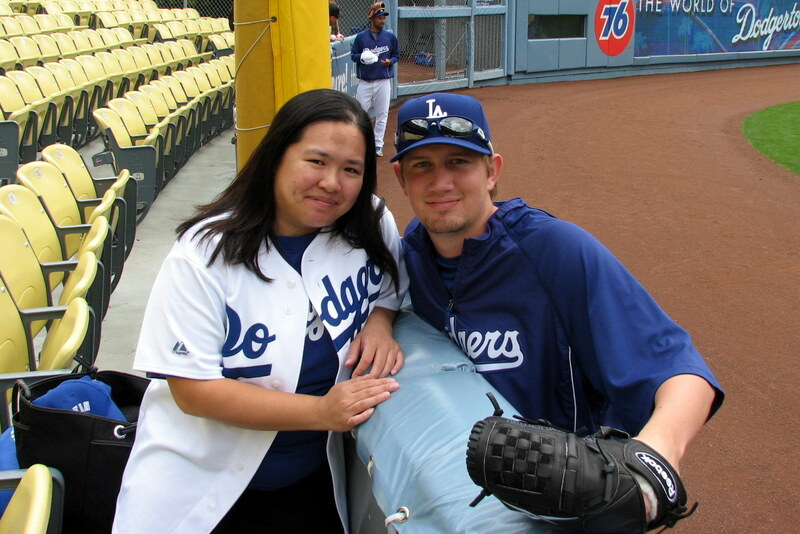 I knew at the last homestand before he got sent down that I probably wasn’t going to see him at the next one. I saw that Navarro was getting close to returning. I’m looking forward to seeing A.J. come back. I can’t wait till he gets a chance to be an every day catcher instead of a back up. While I was at the El Segundo Library on Wednesday without any internet reception, I went through my game log and figured since I am close to my 150th game, it was time to look over my stats. 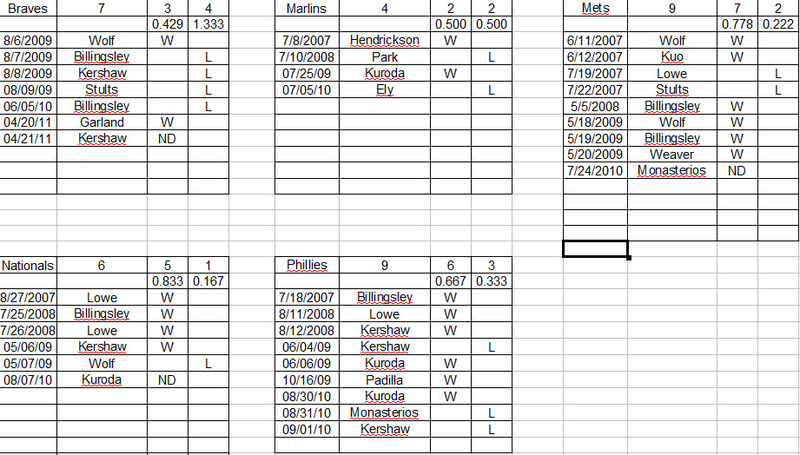 This is just part of my pitching chart. I have other pitchers listed, like Derek Lowe, Brad Penny, and the various other starters who only have one to five starts. 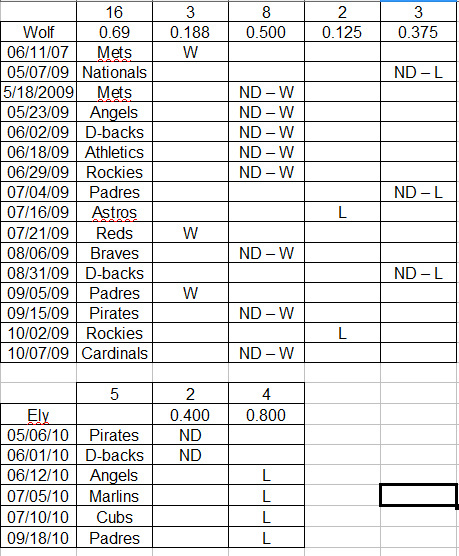 As you can see, I have yet to see the team lose when Jon Garland is pitching … and I have yet to see John Ely get a W. Granted, both of the Dodger victories when Ely pitched were walk off victories (Ethier grand slam and Anderson single). Now for some divisional stats. Of course, we’ll start within our own division. Sorry if some of the charts are small. I’m guessing at the thumbnail pixels as I’m loading them. You can click on the thumbnails if you want to make them bigger, of course. 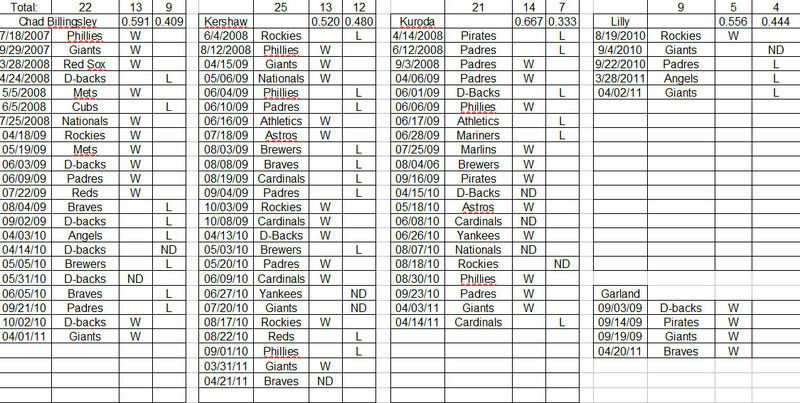 Is it no surprise that of the other four teams, I’m barely above .500 against the Giants and the Rockies? Check out the D-Backs: 14 – 5! Next, the Central Division. This is where things get interesting! 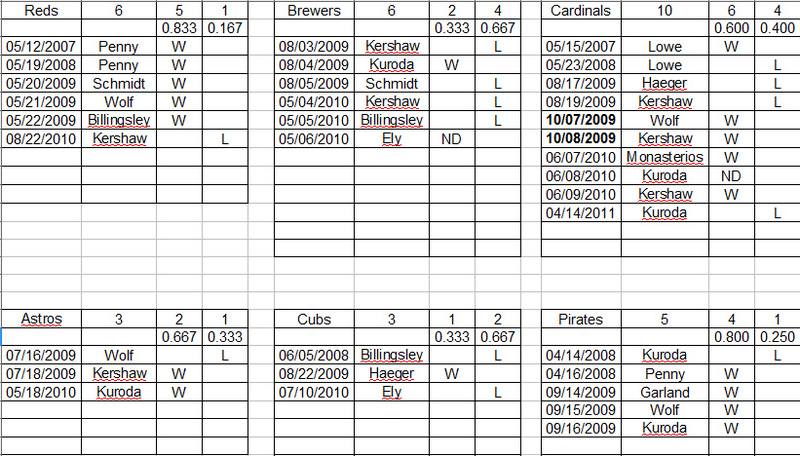 I’m a little surprised by how many Cardinal games I’ve been to, versus the Astros, Cubs, and Pirates. Any surprises here? No, not really except maybe the Brewers. Finally, the NL East. Again, not really any surprises here. I’m a little surprised I’ve only seen the Marlins once each year. Maybe because they’re usually weekend series and I only go on Saturdays during those. I don’t really get to go to Friday or Sunday games except maybe once or twice a year. I suppose I could have waited three more games till 150… but I had the free time on my hands and no access to the internet. Now that I have a new job, who knows how much free time I’ll have between a full-time and a part-time part-time job. Next post: walk off victories! A few days ago I posted links about ground crews and tarps. Well, I didn’t look through the MLB video archives till tonight. Looks like members of the Rangers were at it again with their shenanigans. After the game between the Rangers and the Orioles was called off due to weather, some of the Rangers decide to have some fun. Wouldn’t it be awesome if there was a “Slip ‘n Slide” day at Dodger Stadium? Say during the middle of summer while the team is on the road? Pull out the tarp, get some hoses running, and let fans slip and slide after they watch a game on the Dodger Vision. I suppose it’s a huge liability though because people can get hurt. I’d sign a waiver and do it! If Major League baseball players can go slip ‘n sliding on the tarp, why can’t we? Well, maybe not here in California since we’re always in water conservation mode or in the middle of another drought. These kids took advantage of the wet grass during a Spring Training game between the Dodgers and the D-backs. I think I rather slide on a tarp than on wet grass wearing a poncho. Pirates outfielder Andrew McCutchen loses his glove after he tries to steal a home run away from an Orioles batter during a Spring Training game. What does he do? He hops the wall and gets his glove back. I missed this one during the Giants-Dodgers opening series. I heard about it on the radio. Aubrey Huff made two diving catches during one of the games. The next day, they did a chalk outline in the outfield and it was there during batting practice. Yes, I completely missed it. They don’t have a video of this up on MLB.com, but I saw it on MLB Network. I think it was the Brewers/Phillies game … well it was in Philly, that much I know. A fan near the fence tried to jump for a foul ball that rebounded in the stands and headed towards the field. He missed the ball and the momentum carried him over the fence/wall. He grabs the fence and with some assistance he makes it back into the stands instead of landing on the field. I guess he didn’t want to get tazed. Well, he made it back minus a flip flop! He was wearing black socks and black flip flops! Apparently on Sunday, all the members of the St. Louis Cardinals dressed in turtlenecks! And believe me, it was HOT out here in L.A. Turtlenecks? Really? I know it’s expected, but it doesn’t mean I have to like it. Apparently, long time Texas Rangers fan Nola Pearman probably thinks the same thing. In case you missed it, here’s the link to the story of how Nola Pearman “follows home run protocol“. Fortunately, I rarely sit in home run territory. And I rarely catch any balls landing anywhere near my vicinity. I can’t even catch a soft toss from a ball boy! I have two witnesses who can attest to that. If I ever in a million years “catch” a home run from an opposing team, would I throw it back? I think for me, it would depend on the circumstances. The majority of the time, I probably would throw it back. But if it’s a team I like or a player I like or something like that, I’d probably prefer to keep it. I always joke about having an extra ball and doing some kind of switch-a-roo. I wonder where in the rule books does it say there is an opposing team home run protocol… or maybe it’s just one of the many unspoken rules of baseball. I was watching Intentional Talk on MLB Network with Chris Rose and Kevin Millar and they showed this video. Videos involving tarps on the field crack me up! So I did a little youTube search for videos involving Grounds Crews. This one is during Spring Training. Watch out for the :30 mark. Must be a Yankees thing. This next video is from a Boston/NY game in 2008. I couldn’t find a decent YouTube video of when the Phillies helped the grounds crew in Florida with the tarp. But I found this a fan video of the Phillies helping the grounds crew in … Colorado! Another fan video … inter-league game between the Texas Rangers and New York Mets… This looks like fun! Now, back to Florida. It’s an oldie but a goodie!